Wiley & Readcube have done something rather sneaky recently, and it’s not escaped the attention of diligent readers of the scientific literature. Dear @wileyonlinelib, If I ask for a PDF, don’t shove @readcube HTML at me, give me the PDF! If I wanted HTML, I’d have asked for it! This @readcube default download choice in @BiolSciNews is truly annoying. I only want the PDF, not to be asked to create another account. This is incredibly annoying – they are literally forcing us to use Readcube. That is not cool. Some will rush to the defence of Readcube and point out that if they detect you have the rights to, you can download the PDF from within Readcube, but that’s missing the point. No-one need waste their precious time whilst Readcube takes ages to load in your browser tab, when all you wanted in the first place was the PDF. Install the add-on called YesScript and ‘blacklist’ all Readcube-tainted websites. Use Vince Buffalo’s ‘Get Me the F**king PDF‘ Chrome plugin. It’s really good. D) Underneath the “Privacy” section, click the “Content settings” button. I’m tempted to say: install Chrome or Firefox but I’m well aware that some unfortunate academics have ‘university-managed’ computers on which they can’t easily install things. If so try the instructions for IE here. Let me know if you have better solutions for unfortunate IE users. Added bonus function – extra privacy! 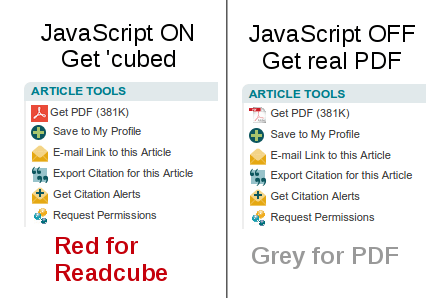 Above all I think we should #BlockReadcube not just for our own utility (easier access to the real PDF), but to send them a powerful message: we do not want the literature to be assimilated and enclosed in rights-restrictions by new technology. We do not want non-consenting ‘cubification of the research literature. 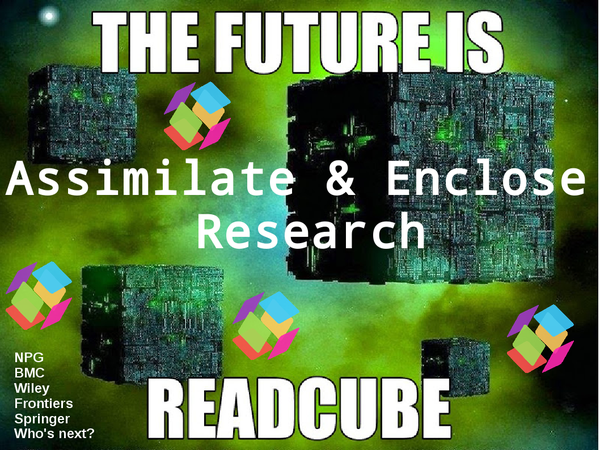 We are Starfleet, and as far as I’m concerned: Readcube is the Borg. PS If you like some of the features of Readcube, try Utopia Docs – it’s free and it’s released under an Open Source license, and it doesn’t force you to use it! Update 2015-03-20: This post does not indicate I’m suddenly ‘in favour’ of PDF’s by the way, as some seem to have interpreted. 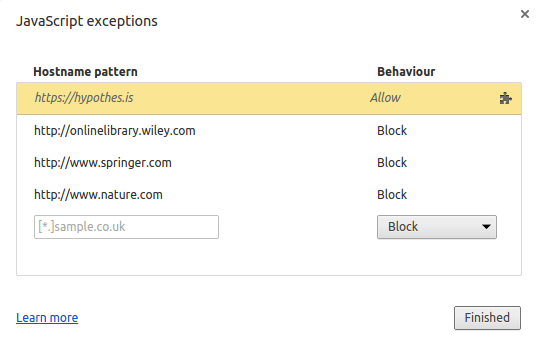 If Wiley wanted to do something good, they should publish their full text XML on site like other good publishers do e.g. PLOS, eLife, Hindawi, MDPI, Pensoft, BMC, Copernicus… If they did this then readers could choose to use innovative open source viewing software such the eLife Lens. That kind of change would add value & choice, rather than subtract value (& rights) as they have in this case. I’ve just given an email interview for Abby Clobridge, for a forthcoming short column in Online Searcher. 1) Why are Open issues particularly important for early career researchers? Science is digital and online. Virtually no-one hand-writes a manuscript with pen & paper. Our digital research objects e.g. papers, data, software, if open as per opendefinition.org can be freely copied and shared to all, for the benefit of everyone. Yet legacy business models from the past are putting awkward constraints, restrictions and obstructions on the publishing and re-use of our research objects. This is deeply wrong. For reasons of efficiency, economic benefit & morality our research should be open, particularly if it’s publicly or charitably funded. Non-open research creates horrid inefficiencies and inequalities that effect us all. Early career researchers are the future of research; we are the ones who can put things right and do research as it should be done – maximising the utility of the internet for low-cost, open dissemination, evaluation and discussion of research. If the early career community don’t act now to help change things, change simply won’t happen. 2) What kind of changes would you like to see within universities/colleges in regard to Open Access, Open Education, or Open Data? All lecture material material should be openly-licensed and available online. It’s mad to think that lecturers all over the world are creating new slides every year with essentially the same content. Deeply inefficient. Share teaching materials. Re-use & adapt good content you find. Save time & enrich the quality of your teaching. Teaching in many ways stems from research. There would be a lot more open content available for worry-free re-use & adaption if research papers, particularly research figures were openly-available. I honestly don’t think research academics are all that aware of the licencing costs involved for re-using non-open research to which a traditional publisher has taken the copyright of. Peter Murray-Rust has a great example of a Nature paper, that if you want to print 10 copies of it for teaching purposes, it costs $1610 USD, not including the paper & ink, just the licence to reproduce! It’s ridiculously obstructive and a waste of good research. No one will use that paper for teaching because of the prohibitive licencing costs. By contrast, open access papers published under the Creative Commons Attribution Licence (CC BY) can be emailed, put on Moodle, printed for no additional cost, nor does one need to ask permission before re-use. Open removes barriers and makes life easier for everyone. With respect to data & software, institutions need to train-up their staff & students more in terms of research data management, reproducible research, git & version control. It’s mildly embarrassing that external (but brilliant) organisations like Software Carpentry & Data Carpentry are taking up the slack and giving everyone the training that they need. All Software Carpentry sessions in the UK have been packed as far as know because that kind & quality of training simply isn’t being adequately provided at many institutions. 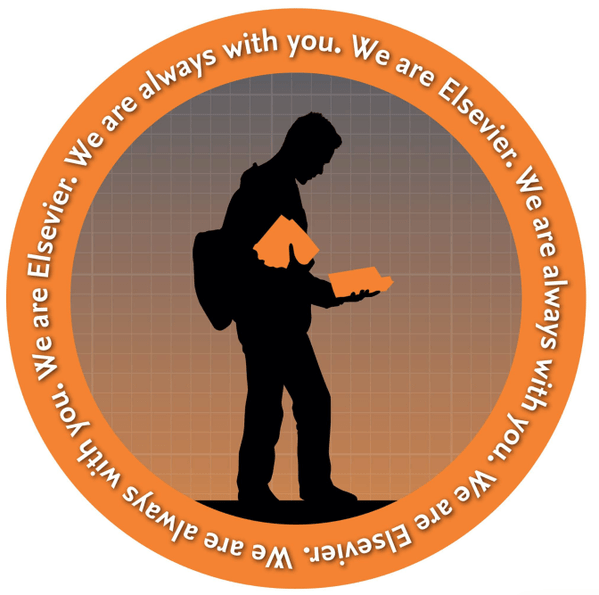 3) What can librarians do to support ECRs in regards to being open? 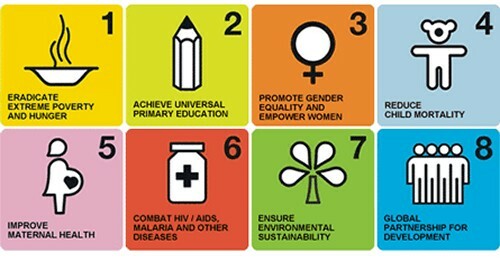 4) What action(s) have you personally taken to support or promote openness? How long a list do you want? * Helped start-up ‘Open Research London‘, an Open Knowledge community meetup for people interested in open research, in the London area (@OpenResLDN on Twitter) sister groups are Open Research Cambridge and Oxford Open Science. * Helped convince the Systematics Association to get sponsorship for their early career conference (Young Systematists Forum, 2014) from PeerJ — mutually beneficial support! What do I think of NPG’s recent #SciShare announcement. Will it help people gain access to research? No. I think it’s just another form of #BeggarAccess. The actual terms & conditions of the scheme are extremely limiting and do not resemble the initial hype around the scheme when it was first announced. The Open Access Button and #icanhazpdf remain as the most optimal solutions for access to proper copies of NPG articles. What do I think of the attitude and prevalence of academic copyright infringement amongst early career researchers? Everyone is knowingly or unknowingly committing copyright infringement at the moment. If we didn’t, research would be incredibly painfully slow and inefficient. Ignoring silly laws is what my generation do. For context; the Napster generation was 1999-2001 – that was a long, long time ago. We know how to share files online. We know how to use torrents. I really don’t know why libraries don’t cut more subscription journals – the academic community is very good at routing around damage caused by paywalls. Have faith in our ability to find access, even if the institutional library can’t provide it. Cut subscriptions, let them go, we don’t need or want the restrictions they offer.